I'll be brief. 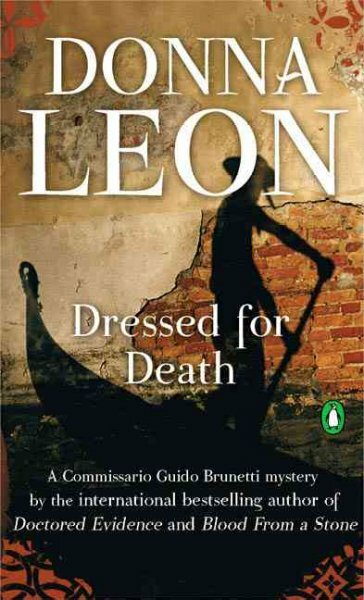 I listened to another Commissario Guido Brunetti Mystery just a few weeks after listening to A Noble Radiance. This time I got Dressed for Death in audio on compact discs. It was originally titled The Anonymous Venetian. I am working my way to the beginning of the series, having had book 7 and now book 3. What I like best about Leon's mysteries is just hanging out with her main character. Guido is a likable family man, who seems to truly regret that his work demands so much time that he misses important events, in this case a family vacation in the mountains. Instead, he stays in a blistering heat of Venice to solve a murder, which turns into a case of murders. His family complains, but they still seem to really love him and understand how important his work is to him. There seems a warm acceptance when they are reunited. How Guido handles suspects, witnesses, and survivors and relates to his boss and other police drives the story more than solving the mystery. The police seem to spend much time just gathering facts with no idea what they are seeking in the two books I have read. Then toward the end, the commissario understands and goes out on a limb to challenge the guilty party. The two books that I have read were similar in that there was no rush to get to the solution, giving me time to just watch the commissario work in a city that I would like to visit. Good reading. Leon, Donna. Dressed for Death. BBC Audiobooks America, 1994. ISBN 9780792763666.